I have always been a little reluctant to letting new technology into my personal life. I held off years on my first cell phone (it wasn’t until my senior year college roommates refused to pay for a house line that I was forced to get one! ); I was one of my last friends to get a Facebook account (although now as an expat it is my main connection to “home”). I even somehow convinced my wife to buy cheap POS non-smart phones when we first arrived in the DR instead of an iPhone (to my defense it did have a built in FM radio and a flashlight!). However, my teaching life is a different story! I am constantly searching for new ways to incorporate technology into my class. One of my goals this year was to increase the publicity of my students’ work and another goal was to encourage more conversations between parents and their children about school. So I decided to open up a class Instagram account to share student work and let parents “see” what we are doing in the classroom. Here are a few things I have learned so far. Before jumping right in, I decided to set up a personal trial to see how it would work for me in my classroom. Before I went to the principal, more on that later, or opened the account up to parents, I began taking pictures and posting them. I wanted to see how often I would be able to do it. I wanted to know if it would interrupt my teaching. I wanted to see if it would be something that I felt would be truly beneficial. Above all, I wanted to know how it would work before I began working with it. This first thing would be to get the approval of my principal. I knew before even asking that my principal would be supportive, and of course he was. He was also helpful in being a sounding board as I worked out the details. I also knew I would need the support of my students’ parents. I wrote a parent email with general guidelines on good social media use, which you can read here. I made a video as well for parents explaining why I was doing this and what I would hope to get out of it, which you can watch below. I made sure to be very aware of the students on the no-public-photo list (I have a copy posted right next to my desk). I also decided to keep the class account private and only give parents access to it, which has all helped in getting buy-in. At this point I try to post one picture a day. Most pictures show students working or are quickly posed pictures of student work. I include a short caption describing what we are studying and a question that parents can ask their child to start a conversation about the topics we are covering. I also include an occasional fun picture or group selfie of the non-academic stuff we do around school. My next step with Instagram is to try and better the dialogue that happens by increasing the number of comments. I am planning on inviting students to follow the account as well and to incorporate the account into lessons. Next year I will introduce the project at back-to-school-night to parents and students to set the stage on how to best use this tool. The Device: I am fortunate to have a school iPad to use for my class Instagram. This keeps my personal Instagram account on my phone and the class one completely separate, that way I don’t have to log in and log out throughout the day. 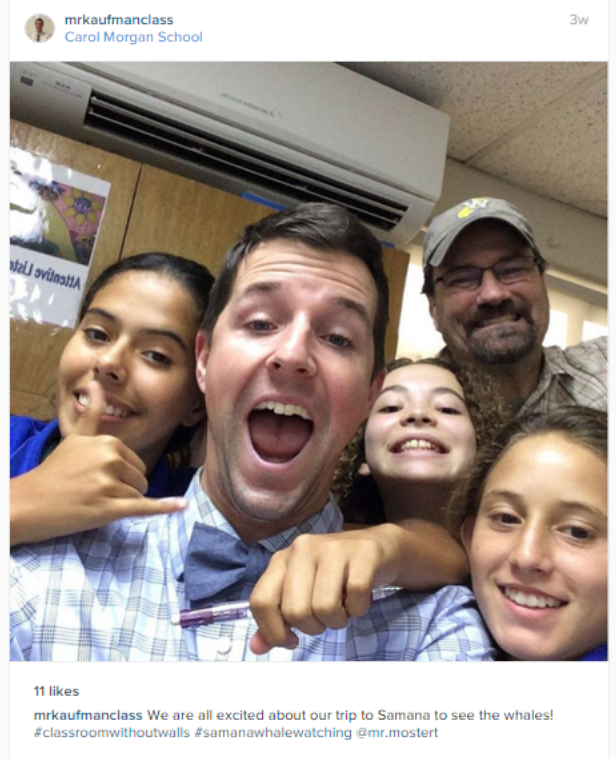 The Purpose: I know some teachers use Instagram to better communication with students – to post reminders, share student work, extend student conversations. I am trying to better communication between myself, parents and students. Maybe you would like to share your class with the entire school community and you decide to open the account to everyone. Just be clear on your purpose. Following and Followers: I have decided to not follow any parent or student using the account, and to keep it private for just parents and students of my classes. This way the account stays focused just on school. However, maybe you find it beneficial to use Instagram to deepen the connection of your learning community (parents, teachers, students) and decide otherwise. Parents Without Instagram: I know that some of the parents did not have Instagram. What I have suggested is for parents to open up an account on their computer, which will allow them to view and comment without having to post any pictures of their own and so that they don’t have to download the app on their device if they don’t want to. 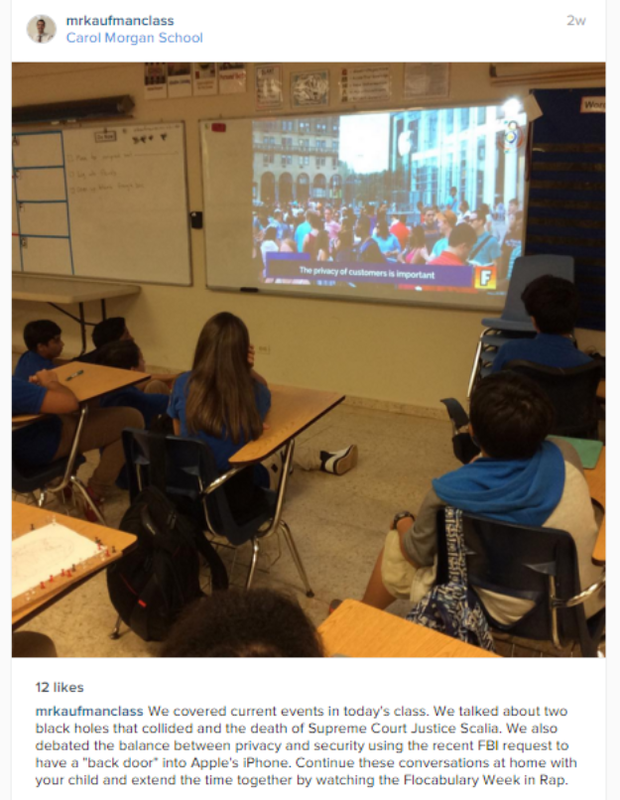 How do you use social media in your class? Please share some of your ideas below.